Interview questions that require you to brag about yourself aren’t easy, so I’m going to walk you through exactly how to give a great answer, with word-for-word examples to help you get hired. This is a time to brag, not be humble. 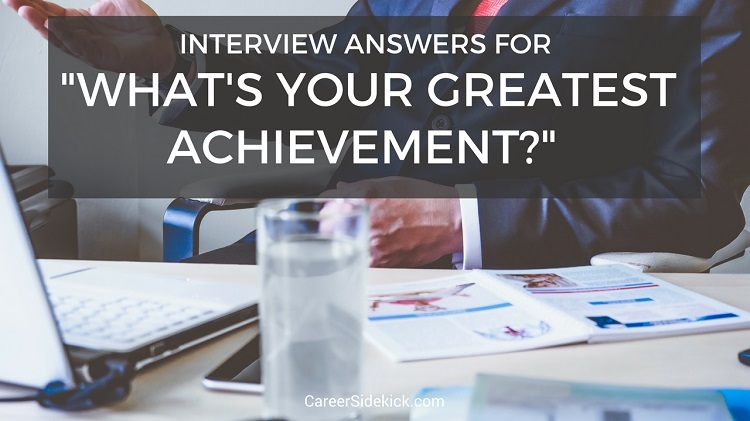 Think about your greatest professional accomplishment and how you achieved it. I recommend picking something that’s as recent as possible, and somewhat relevant to this job or your career. I realize this isn’t always possible. If your best, most impressive accomplishment is five years ago, you can still use it! My point is that if you’re debating between a few options of stories to share, you should always choose more recent and more relevant to the job you’ve applied for whenever possible. And be sure to choose something that had a big overall impact on your career. Then get specific and talk about RESULTS. Show exactly what you achieved and why it was a significant accomplishment. How did it help you? How did it help your team or your employer at the time? If you just graduated and your accomplishment was in an internship or in a university class, what did you learn, what challenges did you overcome, and how did this help you get to where you are today? Now that you have a general idea what to do when you answer these questions about your proudest accomplishments/achievements, let’s look at two word-for-word example answers. I’ll start with an example for a recent graduate. Then I’ll give a second sample answer for if you have previous work experience. My greatest professional achievement was completing my Bachelor’s degree in 4 years with a 3.8 GPA. I had no financial support from my family and had to work a full-time job while pursuing my Economics degree. This taught me to prioritize my time, build great habits and stay focused on my goals. I’m proud of this accomplishment and I feel that what I learned is going to give me a big advantage in my career now. My greatest professional achievement was turning around the success of my last employer’s Marketing department. When I joined, the entire team was struggling and we were failing to hit our quarterly goals. I was hired to create a new marketing plan, which I designed and implemented without any guidance. Within 6 months, we were achieving 20-25% above our goals, and my marketing plan brought in an additional $3 million in revenue for the company through the second half of last year. This additional revenue brought the company from an operating loss each quarter to profitability. After you give your answer, you should definitely expect follow-up questions. When employers ask for examples of your greatest achievement, it’s to find out about you as a person – your interests, your strengths, etc. This isn’t just a question where they ask and move on. So don’t panic when they ask for more details or continue with related questions. It just means they’re interested in learning about you and hearing how you handle challenges and why this particular achievement made you proud. In fact, if you hear a follow-up question or a comment like, “oh, tell me more about ___,” I’d say it’s a sign you gave a great answer. That’s why they want to learn more. So stay confident and calm, and when you prepare for your interview, you should think about the questions they’re most likely to ask you AFTER you share this story. What piece of the story are they likely to want more information about? What might they not understand the first time you tell it? Nothing comes out perfect the first time – so make sure to practice a few times before going into your next interview! Go over the key points you want to share, and make sure you can explain the story clearly while transitioning from one key point to another. Note: I don’t recommend memorizing word-for-word. That’s a good way to panic in the interview, forget a piece, and make a mistake. Instead, I’d do what I described above – think of your story as a series of key points to talk about, and make sure you can remember to hit each point and transition smoothly between them. Make sure you can get from the beginning of your story to the end when explaining your greatest achievement to employers, without forgetting any pieces of your story. Once you can do this a few times, you’re ready for the interview. Get specific and talk about real results and data whenever possible. What was the impact of your work? If you follow these steps, you’ll have a great answer any time an employer asks, “what accomplishment are you most proud of?” (or similar questions).